Homelessness is a major inequality in Canada. In our past it was an unusual and exceptional circumstance, prior to the 1980s there were very few homeless people or families (3). Today, unfortunately, it is a well-known issue, and 150,000-300,000 of Canadians face this struggle each day (1). The question to ask ourselves is what caused this growth of homelessness and what we can do to change it. 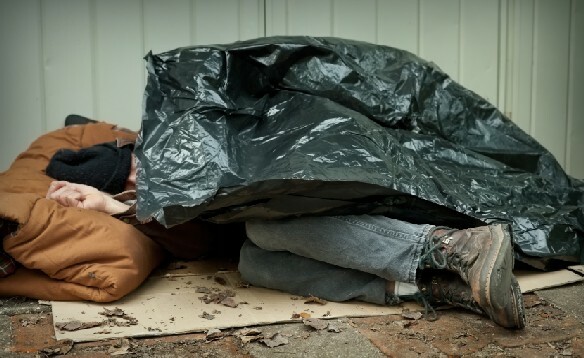 Homeless man sleeps on street using cardboard and garbage bag for blankets (5). Canada’s involvement in social assistance has been a bumpy ride. Until 1964 there was little contribution from the federal government. From 1964-1984 the government began to broaden their social contributions by committing to build a non-market social housing sector. However, in 1984 the Mulroney Conservative government began to cut support for social programs. In 1995, the Chrétien Liberal government withdrew completely and since then there has been little contribution from the federal government (2, 3). A factor that continues to contribute to the number of homeless people in Canada is the inadequate social assistance, housing and resources. An approximate 3.2 million Canadians could benefit from “social assistance, housing improvements, and low-cost living” that is not offered (4). Without Federal support, many municipal governments are unable to “meet the demand for affordable housing” (3). Currently, social housing units are few in numbers, and often unaffordable, inadequate and unsafe for the persons within them. Social housing should support those who are living in them with the resources they need. For example, the elderly and disabled people should have homes suited to their needs (bath rails, one floor, etc.). These people do not have what they need, nor are they in the social position to control or bring about change. The Canadian Government refuses to recognize homeless Canadians their right to adequate social housing (6). The problem is not just governments’ failure to act, Canadians need to contribute as well. We need to know more. With only a few exceptions, no one chooses to be homeless and risk its violence and degradation. Society tends to judge the people on the streets “as lazy, undeserving or less worthy than ourselves” (4). Knowing what homelessness is, what causes it and how uncontrollable it is for the people influenced by it are necessary steps to addressing the problem. Our country can end homelessness. Instead, our governments have chosen to dismiss those who are in need. We need to establish safe, numerous and affordable social housing and provide assistance to bring people off the streets. We need to once again live in a country where homelessness is an unusual and exceptional circumstance.